TKG Academy is the first Gurukula school established in the Western world by His Divine Grace AC Bhaktivedanta Swami Prabhupada, Founder-Acharya of the International Society for Krishna consciousness. Srila Prabhupada, a pre-eminent scholar and world renowned leader brought Gaudiya Vaishnavism, a form of Hinduism and ancient Vedic culture from India to the Western countries in 1966. He inspired in his followers a lifestyle of genuine spirituality, focusing on developing virtuous character, compassion, austerity, cleanliness and mercy. 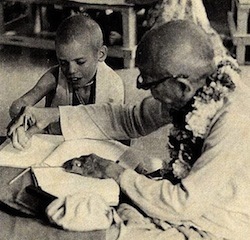 Srila Prabhupada teaching a young student how to write. One of his most important tasks was to establish successful Gurukula schools throughout America and worldwide. Gurukula, the Vedic system of education, literally means ‘House of the Guru’ where students are guided by the teacher in a loving, consistent and peaceful environment. The primary focus of a Gurukula education is to instill an honorable character, a love for service to God and to create responsible successful citizens for the world we live in. The philosophy taught in the school is derived from the teachings found in the Vedic scriptures, such as Bhagavad Gita As It Is and Srimad Bhagavatam. Developing students with high academic standards becomes effortless with such an excellent spiritual foundation. TKG in TKG Academy stands for His Holiness Tamal Krishna Goswami. He was a dynamic, influential and powerful guru, winning the hearts and minds of all he met. It was his personal instructions and guidance that have formed the existing academic and spiritual standards of TKG Academy. He invested a considerable amount of time training and instructing the teachers, perfecting the curriculum, and creating a nurturing community where the school and its families can thrive.